The power required to run the AMI meter is borne by the homeowner, this was never disclosed to the public that their bill will go up by over ~$115.00 per year just to power the meter. I respectfully disagree with the above type of claim and will provide various levels of evidence on this webpage to demonstrate that electric utility meter electronics are actually powered from line voltage that is not registered as consumption for the consumer. There are lots of reasons to oppose smart meters, but how much power they consume and whether it is registered by the meter is not one of them. Design evidence demonstrates that smart meter electronics are powered by the utility line voltage, and the meter power usage in any case is quite small and wouldn’t be much of a factor to the individual consumer even if it were registered to the customer. Since that time, I have not encountered credible information to make a different conclusion than was supplied by the City of Naperville several years ago. Do I have to pay for the cost for electricity needed by the meter to transmit usage information to FPL? No. There are essentially two “sides” of the meter – the source side, which is the utility side, and the demand side, which is the home and business side that is used to calculate your bill. The power used to drive the meter and communicate with FPL is obtained from the source side of the meter and thus is not registered on the display, nor charged to the customer. Elsewhere in the same sheet is says that the “starting watts” is either 12 watts at 240 volts or 6 watts at 120 volts. An analog meter by comparison cannot normally register power consumption until it reaches something like 24 or 25 watts. This can account for some of the differences one might see between switching from one type of meter to another. If the power consumption of the home is between 12 watts and 24 watts as one example, it would not be detected by an analog meter but would with the ACLARA meter. Also note that the specification sheet says “Low burden, which minimizes utility system losses.” The utility industry normally refers to the power consumption of a utility meter as a “burden” as it truly is a burden to the utility and not registered to the consumer. Since the burden is not registered to anyone, it is also considered to be among the many “line losses” in the distribution system that utility companies must face. The specification sheet refers to a “typical watt loss: 0.7 Watts” which would be the actual power consumption value that ACLARA is claiming for its meters, i.e., a very “low burden.” Note that this power consumption level would be nearly negligible to an individual consumer whether or not it could in fact be registered by a smart meter. 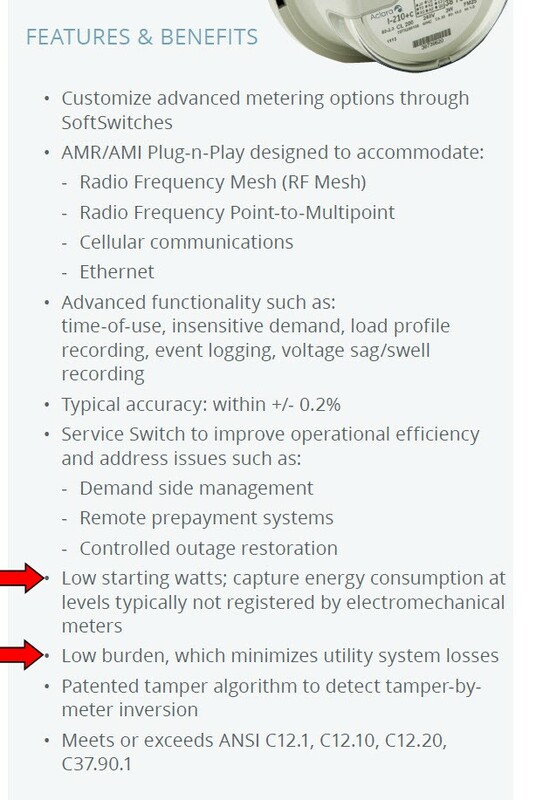 Again note how the manufacturer is boasting about how little power the meter consumes in order to avoid “system losses.” If the power consumed by a smart meter were charged to the customer, this power would not be referred as a system loss. Now let’s look at an expanded view of an Elster REX-type smart meter as shown in the graphic below. In the components marked as “8 – voltage connectors,” these are the conductors that are in actual physical contact with the top meter stabs as utility supplied current enters the meter and thus also allows voltage to be supplied to the “4 – electronic assembly” portion of the meter. In this configuration, there is no other alternative but to conclude that power being supplied to the meter electronics is prior to current flowing through the meter sensing devices which are inside the meter and which then at that point would register power being supplied to the customer’s load. If the smart meter were powered from the customer-side of the meter (with resultant registration of self-consumption power), once the customer were disconnected, then there would be no power to cause a “remote connect.” This is especially true since many smart meters deployed today are not equipped with batteries. What is actually the case, since the smart meter electronics are powered from the utility side of the meter, is that the meter remains powered, able to receive and send RF signals, even when the customer’s service has been disconnected through the remote disconnect switch. The claim of someone’s bill going up by approximately $115 per year (due to smart meter power consumption) was based upon results by one individual in a home with a smart meter and whose home was unoccupied for a period of time and where it was believed there could be no electrical loads. 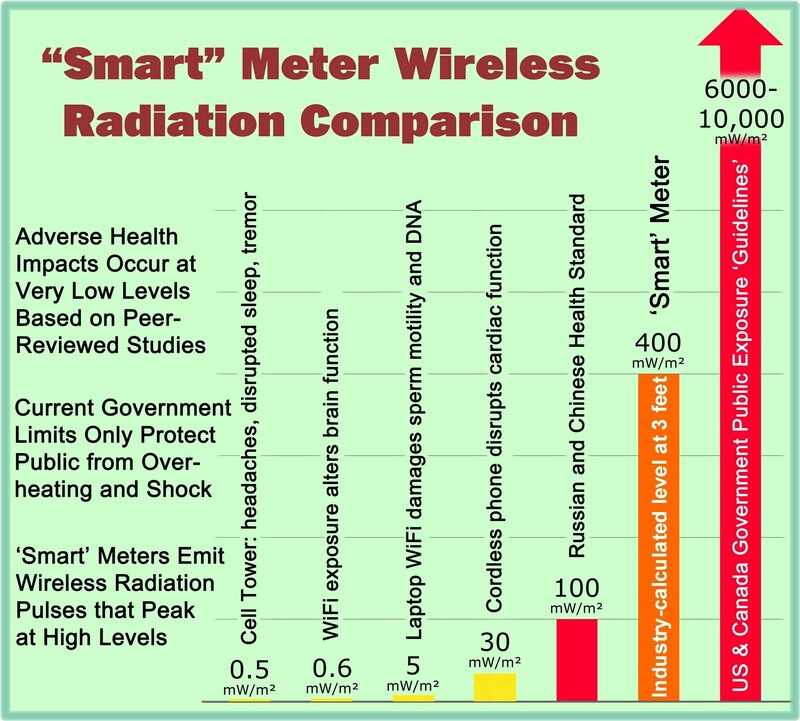 An unexplainable consumption level of approximately 100 watts as measured by the smart meter was attributed to the smart meter. Even if some level of power consumption registration for a smart meter could be found to be attributed to the meter itself (see below), it is not plausible that the meter would be found to cause an average load of 100 watts based upon information you have already reviewed from this webpage. Although the powering of the smart meter electronics has been shown to be a “burden” to the utility, I have read that during the course of measuring the current being supplied to the customer, there is effectively an interaction between the current sensor and the conductors passing current through the meter to the customer that results in a small amount of electrical consumption. This consumption that is related to the current sensor could be on the order of a fraction of a watt (as a function of load) and would be registered by the meter as a part of the measurement process. A similar registration process would occur with the traditional electromechanical meter. “Both analog and digital meters require power to operate. Design for efficiency has always been a factor in meter design because a large number of meters are typically present on an electric distribution grid. In both analog and digital electricity meters the energy used to power the meter is taken from the utility side of the load connection. Because the current needed to self-power the meter does not pass through the current sensing element, it is not measured by the meter and contributes nothing to the measured load. In reality, the meters use approximately 1 Watt of power, which amounts to 1 kilowatt-hour about every 42 days. At retail price, the electricity used to power the meter would cost about one dollar per year. Regardless of the amount, this does not contribute to the consumer’s billed usage.